l find this to be a special time of year during which my focus shifts to what I’m creating and what dreams are emerging. It’s a time to set new goals and aim for new adventures. Today, I will unveil the second step in the Destiny Visioning Process. The first step was to look back at the year that is coming to its completion. Did you? What did you find? I would love to know what gold you dug up from that exercise. The second step is to look in a much different but just as rich place. A place I call Dreamland. A landscape that is not linear… but holds the truth about who we are and what we are becoming. 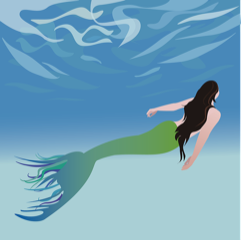 Mermaids live here…it’s time for you to visit! One way to explore Dreamland is through a guided journey. A guided journey bypasses the mind’s limitations and offers you a view of what is possible. What your soul is wanting for you. What is already in the process of creation. A Guided Journey to Your Destiny Vision! I have made a special recording for you! All you have to do is relax and allow me to take you into Dreamland. There are a lot of ways to access your vision and next week’s blog will bring some of the more linear methods into play for your New Year’s joy. Then we will look at your new goals, experiences you would like to have and your bigger picture vision. Today, the offer is for you to take some time to sit back and allow me to guide you into Dreamland. Something super special is waiting for you! This is a simple, yet powerful, exercise. All it requires is that you take about 20 minutes of time to relax. I have made a recording of a guided journey that will take you out five years in time to look around at your life. The guidance in this recording will have you looking at important areas of your life to see what has happened. The purpose of this journey is to unhook the mind from its linear thinking so you can get a sense of what lies under the surface deep in your soul. You will uncover information from this process that will guide you as you begin to plan for the New Year. Besides… it’s fun to go to Dreamland! So find a comfy spot, bring a pad a paper and pen (to take notes after you return) and enjoy. What is important to you at this time in your life? What is your soul longing for you to focus on in the new year? It could be something big and exciting! Or maybe it is small and quiet but oh so yummy when you imagine including it in your life experience. Whether you took the time to enjoy this guided journey or not, I encourage you to spend some time with yourself this week and pay a visit to Dreamland. Maybe you’ll do it on a walk or sitting by the fire or near a body of water. Take some time to tune into your soul and listen for guidance. Tap into your imagination for new possibilities that lie just under the surface. Take time to Dream, my friend….and, as always, I would love to know what you find.